That is one tiny cat or a really large still life. It still seems to work! Diane Hoeptner Art Blog: Oh yay! A comment from YOU!! I am Diane Hoeptner (hep-ner) an artist living in Northeast Ohio. You'll find my new paintings here, posted weekly, sometimes daily. 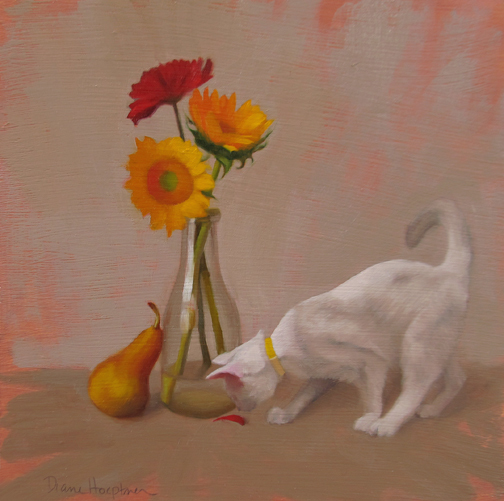 Random musings on painting, life as an artist and cats are a regular part of this blog. Please take a moment and subscribe, you'll never miss a post! About the art: Paintings are ready to hang and display as-is. Click here to see the back of a painting. Available paintings feature Buy Now buttons which link to Paypal. Shipping: FREE within the continental USA. International Shipping: Happy to ship international. I will bill you for the shipping via paypal after purchase. Return policy: Buying art is a personal and subjective decision. Be this your first or your fourth purchase, you are invited to "try out" one of my paintings. If you are anything less then thrilled, return it for a full refund. I Have Cat: Cat Woman Wednesday!